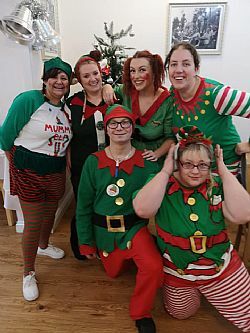 The 7th December was Elf Day at our Forest Hill House Nursing Home in Corfe Mullen. Elf Day is a Festive Fundraiser for the Alzheimer’s Society, the annual event is designed to encourage people to get in to the Christmas spirit whilst raising much needed funds to help combat dementia. At our Royal Bay Care Homes, we have several residents that suffer with dementia so it’s important to both staff and residents to get behind the cause that supports so many people throughout the UK. Our cheeky elves were dressed in festive fancy dress, check out our Facebook page for a few pics of our very chirpy and helpful elves from Forest Hill Nursing Home in Corfe Mullen!